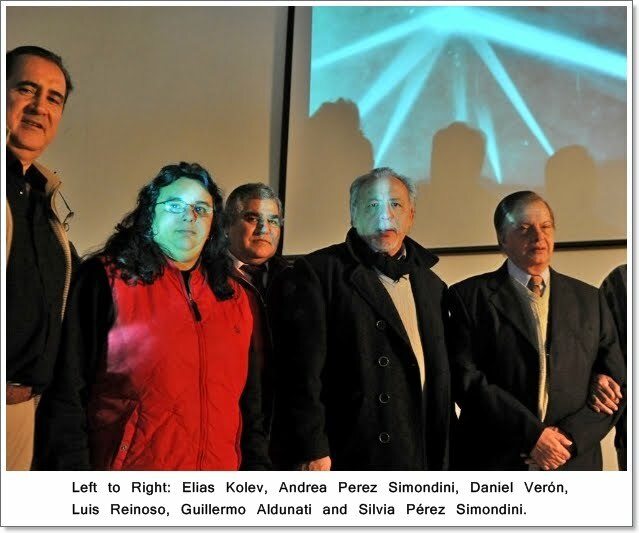 Inexplicata-The Journal of Hispanic Ufology: Argentina: "Four Alien Abductions Occurred in Rosario"
Argentina: "Four Alien Abductions Occurred in Rosario"
A statement by UFO researchers gathered yesterday in an inter-provincial forum. They defined themselves as “cosmic detectives”. They exchanged results of their latest findings yesterday. “We’re cosmic detectives.” These are how the researchers who devoted yesterday’s sunny weather to exchanging their most recent results of their UFO research. They met at Centro de Distrito Sur and spoke on various phenomena related to the subject. The audience was stunned by a fact: in recent decades, four abductions occurred in Rosario that were thoroughly investigated and were even forwarded to the court system. Furthermore, they said that cattle mutilations had taken place in neighboring Victoria (Province of Entre Rios) and that a green light fifteen degrees over the Paraná River illuminated an astounded onlooker, while the recent “crop circles” in Pujato had been created by a very earthly ATV. This was the uncompromising tone of the dialogue held between La Capital and Elias Kolev, Silvia and Andrea Pérez Simondini, Luis Reinoso, Guillermo Aldunati and Daniel Verón – all of them UFO researchers and members of the Visión Ovni (Victoria) and Edovni groups, and the Más Allá del Límite radio show (Rosario). They were, in short, the organizers of the first inter-provincial encounter held yesterday under the sponsorship of the Municipality of Rosario. “The sightings are worldwide. There were chronicles and stories on the subject in all points of history,” they said, speaking of one of the best-known cases. We should know, however, that scanning the skies now has the support of a commission created last year by the Argentinean Air Force to investigate anomalous phenomena. “This gave us institutionality, which is absolutely what we needed for people to understand our task, as the Air Force is not going to waste time on something that doesn’t exist as a phenomenon,” they stressed, summarizing the importance of this endorsement for the task they have been carrying out for years – one that is often seen within the folds of fantasy and reality. “This gives us the chance to explain to people, very normally, that the UFO phenomenon is real without having people think we’re crazy, which is something we’ve experienced ourselves. We faced many years of suffering,” they remarked. “It’s a childhood dream. Forty-six years ago we longed for an official level such as the one the Air Force has granted us, spending several hours in meetings with them to state our concerns and make our private files available on investigative efforts upon which we lavished so much time.” They added that several disciplines play a role in the UFO phenomenon: geopolitics, astronomy, chemistry, physics and exobiology (the study of offworld life), as an example. Why study these phenomena? Researchers boil the answer down to an awakening of awareness. This is precisely the eyewitness information provided by people who claimed having experienced abductions, and which are four in Rosario over the past three decades (non-traumatic cases, free of injuries). It’s about connecting with each other in the cosmos, with its harmony, we are citizens of the universe,” stated the group. Perhaps the audience perceived something of this, particularly with regard to the “questions and doubts” brought about by any mystery worthy of the name. (Translation (c) 2012, S. Corrales, IHU. Special thanks to Sylvia Carafa, La Capital and Guillermo Gimenez, Planeta UFO).